Originating from the islands of Vanuata, off the coast of Australia, is the exotic Ruffled Fan Palm. Known for its unique fan-shape leaves, joined at the tip, and its luscious green colors, the Ruffled Fan Palm makes a statement in any area. 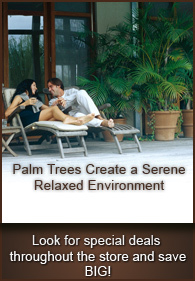 Whether planting outdoors or placing indoors, the Ruffled Fan Palm brings the instant feelings of the tropics. The botanical name for the Ruffled Fan Palm is Licuala grandis and it grows to a maximum height of 10 feet with usual heights around 6 feet. 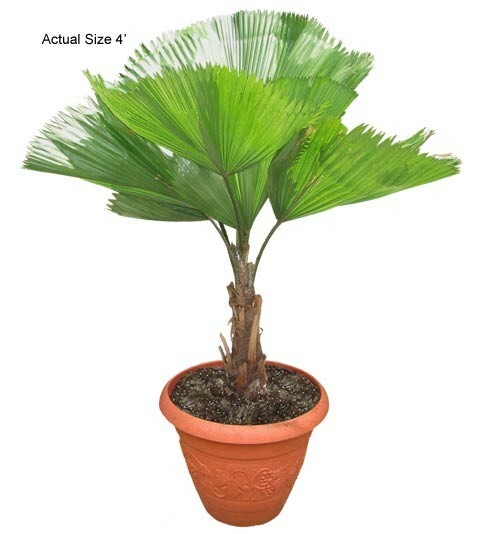 The Ruffled Fan Palm is a slow growing palm and takes years to develop a solid trunk for its beautiful ruffled leaves. As the Ruffled Fan Palm matures its seeds appear as small bright-red marbles. These bright-red seeds give the Ruffled Fan Palm an amazing look and will be your focal point in any garden or inside your home.